To coincide with this new website, we’ve changed our name from Possum New Zealand to Wear New Zealand to reflect our diversified ranges derived from all natural leathers or fibres sourced from this wonderful country. 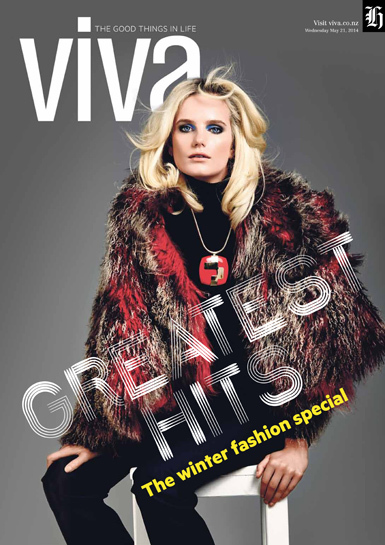 Anmari Botha looking gorgeous in Viva magazine wearing Mongolian Lambskin supplied by Wear New Zealand! This is a new material we're playing with, so keep an eye out for more. Or even better, contact us if you can't wait. Wear New Zealand (at the time called Possum New Zealand) featured in this episode of Pacific Beat Street. Koryn Dunstan interviews Teresa about traditional furriers and learns how Possum fur is prepared to be made into garments, scarves and throws. The episode aired on TV3 in New Zealand. French TV flew to New Zealand to make this informative documentary about the New Zealand possum. They interviewed Possum New Zealand (now Wear New Zealand) about how they convert a pest into fashion. NB: This program aired in France and its colonies. It is in French only. Ms Possum put on a “Jungle Party”. Can you spot how many party goers are wearing possum fur hides as part of their costume? Think Russia, think Sochi Olympics! New Zealand TV Presenter Hayley Holt appeared in New Idea magazine (Feb 2014) wearing our ever-popular Possum Fur Cossack Hat as part of a preview for the Winter Olympics. We make everything here in New Zealand and as manufacturers of our own products, we sell direct to clients from all over the world. And that is what sets Wear New Zealand apart. We hand craft most of our items in our CBD workroom and our designs are original and copyrighted. We are also just starting to work in conjuction with other New Zealand companies who make products that complement our own. It’s a small, niche, New Zealand business, doing specialised things out of New Zealand’s finest natural materials and other specialty leathers. Wear New Zealand has a solid infrastructure from which to grow and expand globally and that is quite exciting after thirteen years of developing the business. To make an item of beauty and object of desire out of an ecological pest is an amazing exercise. Yes, we call our possum products "eco fur" as we believe that combining environmentalism with commercialism is the most successful way of controlling an imported pest that is damaging our forest and fauna, as well as our native birdlife. Add to the mix other indigenous New Zealand raw materials such as spotty Friesian cow skin, bobbly babylamb and luxurious sheepskin and you have the Wear New Zealand mix and match combos that are lately infiltrating the product ranges. From fashion to décor to footwear, we are proud to bring you integrated ranges of the highest quality products all made in New Zealand, by Wear New Zealand. Wear New Zealand’s designs are original and copyrighted. All production processes are undertaken in New Zealand. Wear New Zealand has an ongoing commitment to product development, and prides itself on its innovative approach. Every style is painstakingly formulated to ensure the highest standards of quality and fit. This has resulted in large expenditure of time and resources. For this reason, Wear New Zealand has and will continue to pursue legal recourse on any individual/organisation deliberately plagiarising its designs or concepts. The fur comes from the brushtail possum, a marsupial native to Australia that has become a forest-destroying invasive species in New Zealand. Fur marketers argue that buying furs made from the possums they kill actually benefits the environment. They are protected in their native Australia. But despite their cute looks, these marsupial invaders have become such a menace to the environment in New Zealand that designers who use their fur are seen as national heroes, even by conservationists. Click here to read the full article. Is it acceptable to buy Possum fur? Considered a pest, there are 18 times as many possums as people in New Zealand. They threaten its native trees and wildlife by munching through vegetation. So much so that anything made from possum is dubbed eco-fur. “Buy a possum and save a forest” is the slogan of one [brand], Possum New Zealand. Ms Possum - Designer/Director of Wear New Zealand - is a complex character. In fact, she wasn’t always known by this pseudonym. In the ensuing years, Ms Possum happily moved on to other areas of the fashion industry (haute couture, bridal and leatherwear) without giving much thought to the little marsupials. A series of unfortunate roadside incidents led Ms Possum to believe that she was being persecuted, and that she would need a more proactive approach to handling the 70 million or so Possums in New Zealand. Thus the metamorphosis to Ms Possum began. Over time it became obvious that the satisfaction derived from stretching and preparing the hides, was incredibly therapeutic. Her ‘Possum revenge syndrome’ has begun to abate – although sadly there is no known cure for this psychological condition. We’d love to hear your Possum stories. If you write to Ms Possum, she’ll publish them online, and send you a possy pressie!